If you develop Android apps and want to also develop apps for Windows 8.1 or Windows Phone 8.1, this is a great place to start. We'll show you how to use Microsoft development tools like Microsoft Visual Studio and Microsoft programming languages like C#. You'll learn some concepts you need to know to develop apps for new Windows UI in Windows 8.1 and Windows Phone 8.1. Windows 8.1 and Windows Phone 8.1 introduce a new platform for creating engaging apps. Because these apps provide lots of unique features, a straight port of your Android app will likely prevent you and your users from using these features. So don't just port your app: reimagine your app, and take advantage of features like the app bar, Semantic Zoom, the search and Share contracts, the file picker, charms, live tiles, action center and toast notifications. The following video provides a brief comparison of Eclipse and Visual Studio. To follow these walkthroughs, you'll need a computer with Windows 8.1 and Microsoft Visual Studio 2013 Update 2 installed. To get them, go to the Windows 8.1 for Developers page. After you start Visual Studio 2013 Update 2 for the first time, it will ask you to get a developer license. Just follow the on-screen directions to get one. This license lets you create and test Windows Store apps on your local development computer before you submit those apps to the Windows Store. If you are using a Mac, you can use that rather than a PC. See Setting up your Mac. For comparison, when starting Android app development, you needed to install the Java Runtime Environment (JRE), then the Eclipse IDE, the Android software development kit (SDK) Tools, and the Android Developer Tools (ADT) plugin. 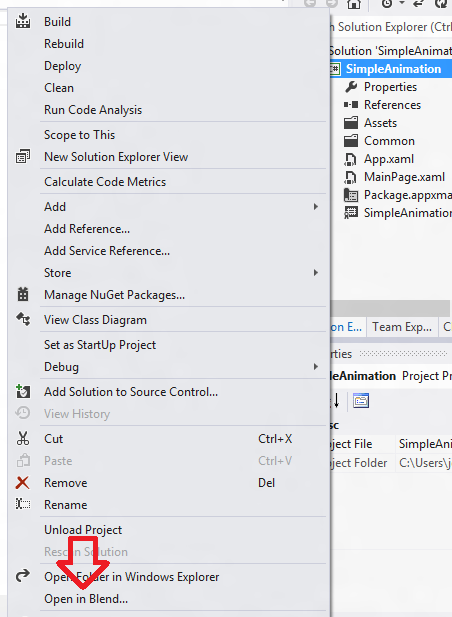 In this walkthrough, we'll introduce you to the basics of Visual Studio and compare them to similar basics in Eclipse. Each time you create an app, you'll follow steps similar to these. When developing an Android app, you start Eclipse for Android, and create a new project by tapping File > New > Android Application Project, as shown in the following figure. 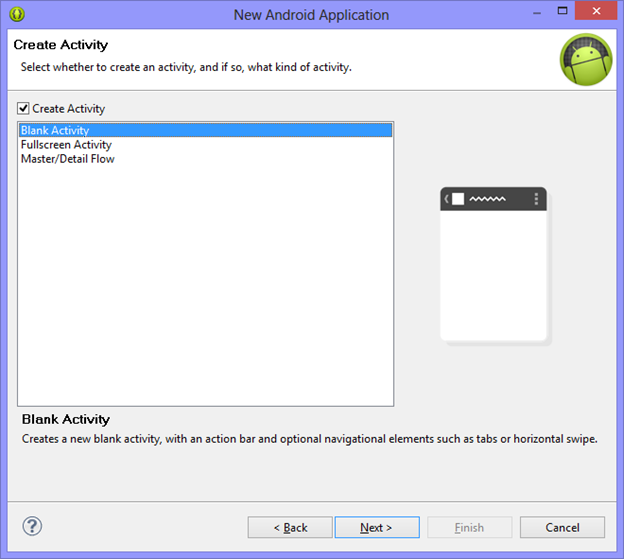 After you create a new Android project in Eclipse, you can select the activity type, as shown in the following figure. When you start Microsoft Visual Studio, you'll see the Start Page, as shown in the following figure. In the Start area, tap New Project. Tap the File menu, and then tap New Project. There are several project templates to choose from, as shown in the following figure. 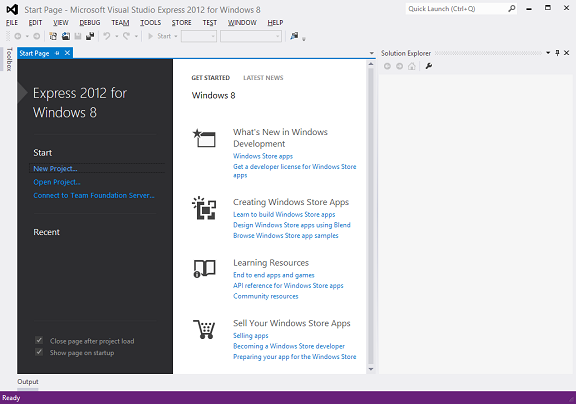 Note Visual Studio 2013 Update 2 introduces Universal Windows apps. These are apps that allow a single solution to contain both Windows 8.1 and Windows Phone 8.1 projects, along with (optional) shared code and resources. Universal apps make it straightforward to develop for both device families simultaneously. In practice you will use a mix of shared and platform-specific source files at compile-time, rather than test at run-time. For more info, see Building Universal Windows appsr for all Windows devices and Using Visual Studio to Build XAML Converged Apps. The Windows Store project template in Visual Studio is similar to the Android Application Project template that is added to Eclipse after you install the Android Developer Tools (ADT) Plugin. For this walkthrough, tap Visual C#, and then tap Store Apps, Universal Apps and Blank App (Universal Apps). In the Name box, type "MyApp", and then tap OK. 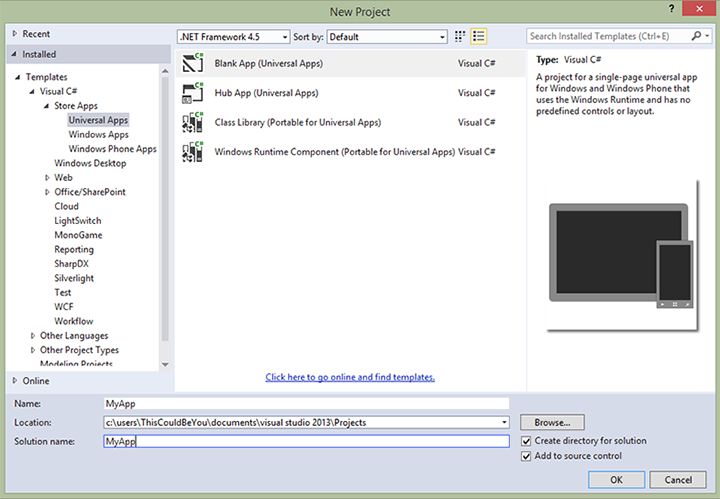 Visual Studio creates and then displays your first project. Now you can begin to design your app and add code to it. The Location box in the Visual Studio New Project dialog box is similar to a workspace that is used by Eclipse. 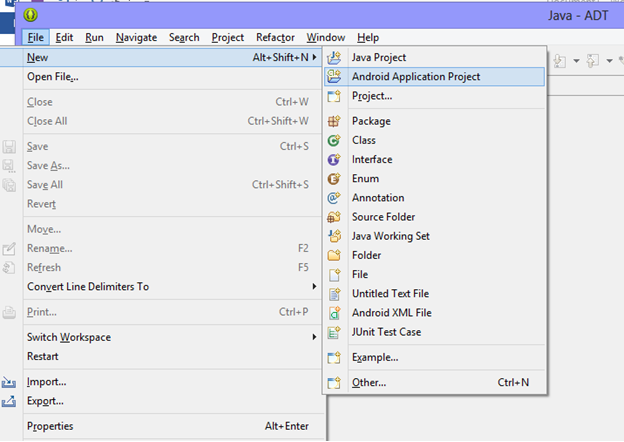 Unlike an Android Eclipse project where you create one activity at a time, Visual Studio includes project templates that create apps with multiple pages and navigation between those pages. The Blank App template, on the other hand, creates an app with only one page. Don't worry, though—we'll add a second page and navigation later in this article. Where is the DirectX SDK? Following is a class written in Java and C#. The Java version is shown first, followed by the C# version. You'll see that the structure is very similar, making it fairly easy to get started with C#. In this example, you'll also see that there are small differences in casing and documentation syntax. Finally, you'll see that C# classes can have explicit properties instead of using conventional getter and setter methods as in Java. * The Counter class shows key aspects of a Java class. private int count; // Private variables are not visible outside. count = 0; // Initialize the local variable. public int getValue()  // Getter for the local variable. public void setValue(int value) // Setter for the local variable. // Add the delta to the local count, and then return. private int count; // Private variable not visible outside of the class. public int Value // Getter for the local variable. /// Increments the counter by the delta. Let's now return to the MyApp project that you created earlier and show you how to find your way around the Visual Studio IDE. Android developers using Eclipse should be familiar with the default view in the following figure, where you have source files in the left pane, the editor (either the UI or code) in the center pane, and controls and their properties in the right pane, as shown in the following figure. Visual Studio is similar, although the default view has the controls on the left side in the Toolbox. 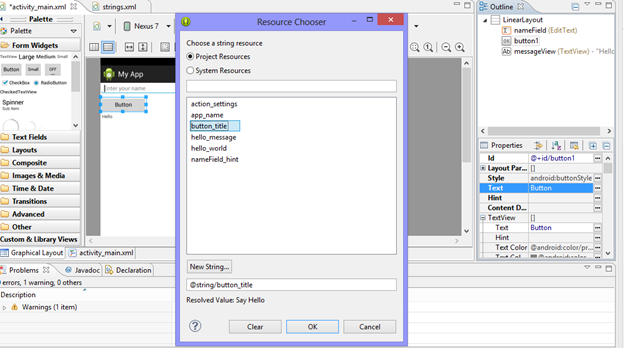 The source files are in the Solution Explorer on the right side, and properties are in Properties on the right side. This layout is shown in the following figure. Notice how as a Universal Windows app, there are three branches in the solution view: one for the Windows app, one for the Windows Phone app, and one for shared content. Solution Explorer in Visual Studio is similar to Package Explorer in Eclipse. 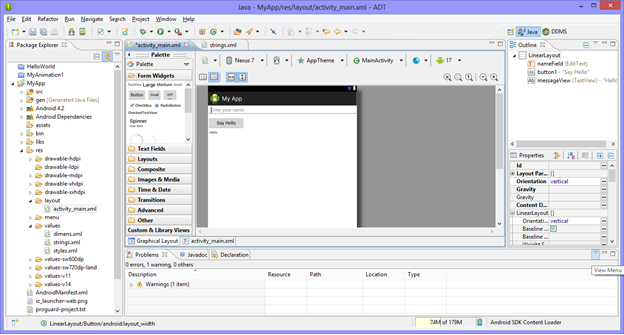 In Solution Explorer, the Package.appxmanifest file is similar to the AndroidManifest.xml file that is used in Android apps. In Solution Explorer, the items in the Assets directory are similar to the items in the \res\drawable-*\ directories of Android projects. You can rearrange the panes in Visual Studio if you want your source files on the left side and controls on the right side. Or like Eclipse, you can choose the windows you need and arrange them according to your preference. For example, to move the Toolbox from the left side of the screen to the right side, press and hold the Toolbox pane's title bar, begin dragging it, and then drop it on the far right drop target that appears in the middle of the screen. 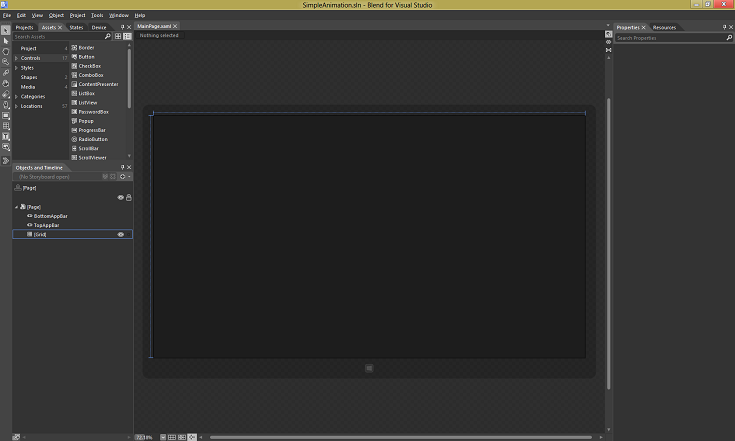 Visual Studio displays a shaded box to let you know where the Toolbox will be docked after you drop it there. In Solution Explorer, press and hold MainPage.xaml (either the Windows 8.1 or Windows Phone 8.1 version) to open it. On the left side, tap Toolbox to display it. Then, in the Toolbox pane's title bar, tap the pushpin icon to pin it, as shown in the following figure. Let's now add some controls to your MyApp project. We'll then change some of the controls' properties, and then we'll write some code to respond to one of the control's events. 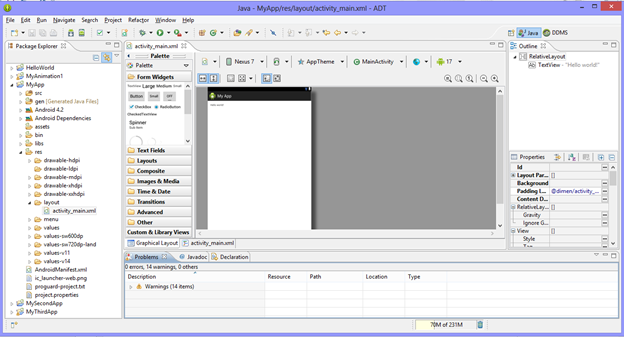 To add controls in Eclipse, you open up the activity XML file in Graphical Layout and then add controls, like Button, EditText, and TextView, as shown in the following figure. In Visual Studio, .xaml files are similar to Android layout .xml files. Let's do something similar in Visual Studio. In the Toolbox, press and hold the TextBox control, and then drop it onto either the Windows 8.1 or Windows Phone 8.1 version of MainPage.xaml file's design surface. Do the same with the Button control, placing it below the TextBox control. Finally, do the same with the TextBlock control, placing it below the Button control, as shown in the following figure. Similar to Android layout .xml files in Eclipse, in Visual Studio, .xaml files display UI layout details in a rich, declarative language. For more info about Extensible Application Markup Language (XAML), see XAML overview. 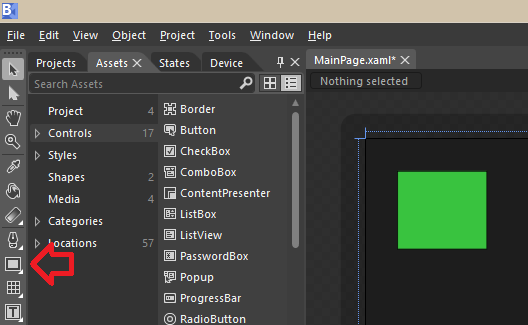 Everything that is displayed in the Design pane is defined in the XAML pane. The XAML pane allows for finer control where necessary, and as you learn more about it, you can develop code faster. For now however, let's focus on just the Design pane and Properties. The *.xaml.cs file that is associated with a *.xaml file is called the code-behind file. When you open a *.xaml file, you'll see a split Design/XAML view by default. By default, the top view contains a visual designer, and the bottom view contains the markup that's generated by the designer. If you want to modify the XAML directly and you need more screen space in the XAML view, either click the up/down arrow button between the Design and XAML views to show more of the XAML view, or click the double-chevron button between the Design and XAML views to minimize the Design view completely. The relationship between *.xaml and *.xaml.cs files is similar to the relationship between layouts and activities in Android development. When you create a generic Android app in Eclipse, you'll see an activity_main.xml file in the project's \res\layout\ directory. This is where you define the UI for your Android app. You also see a MainActivity.java file in the project's \src\ directory. This is where you write the code that goes along with the app's UI. In our project in Visual Studio, the MainPage.xaml file corresponds to the activity_main.xml in Eclipse, and the MainPage.xaml.cs file in Visual Studio corresponds to the MainActivity.java file in Eclipse. Let's now change the button's contents and name. To change the button's contents in Eclipse, in the button's properties pane, you change the value of the Text property, as shown in the following figure. In Visual Studio you do something similar. In the Design pane, tap the Button control to give it the focus. Then, to change the button's contents, in the Properties pane, change the Content box's value from "Button" to "Say Hello". Next, to change the Button control's name, change the Name box's value from "<No Name>" to "sayHelloButton", as shown in the following figure. Let's now change the TextBlock control's name and contents. Tap the TextBlock control to give it the focus. 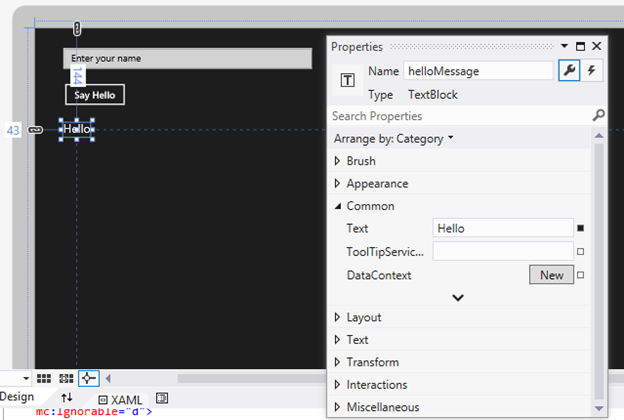 In the Properties pane, change the Text box's value from "TextBlock" to "Hello". Then change the Name box's value from "<No Name>" to "helloMessage", as shown in the following figure. Next, let's change the TextBox control's name and contents. Tap the TextBox control to give it the focus. In the Properties pane, change the Content box's value from "TextBox" to "Enter your name". Then change the Name box's value from "<No Name>" to "nameField". Now let's write some code to change the TextBlock control's contents to greet the user after the user types his or her name and then taps the button. In Eclipse, you would associate an event's behavior with a control by associating that code with the control, similar to the following figure and code. Visual Studio is similar. At the top right of Properties is a lightning bolt button. This is where the events that are associated with the selected control are listed, as shown in the following figure. To add code for the button's click event, in the Design pane, first tap the button. Then tap the lightning bolt button in Properties, and press and hold the box next to the Click label. Visual Studio adds the text "sayHelloButton_Click" to the Click box and then adds and displays the corresponding event handler in the MainPage.xaml.cs file, as shown in the following code. Let's now add some code to this event handler, as follows. Following is some similar code that you would write in Eclipse. Finally, to run the app, in Visual Studio, make the project you are working on the start-up project, by right-clicking and selecting Set as StartUp Project. Then tap the Debug menu, and then tap Start Debugging or Start Without Debugging. After the app starts, in the Enter your name box, type "Phil". Tap the Say Hello button, and see the label's contents change from "Hello" to "Hello Phil! ", as shown in the following figure. To quit the app, in Visual Studio, tap the Debug menu, and then tap Stop Debugging. You can run the app in three modes: on the local machine (for a Windows 8.1 project), in a simulator, or on a remote machine. 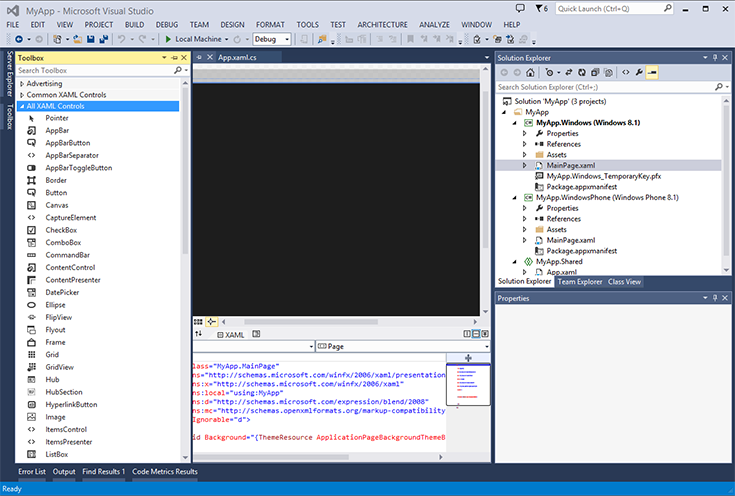 When you run the app on the local machine, the app runs in full-screen mode on the same machine as Visual Studio. You can interact with the app by using the mouse, or with touch if it's available on the machine. The simulator is a desktop app that also runs on the local machine and simulates touch and rotation events. It is particularly useful if the local machine doesn't support these events. It can also be useful for debugging the app and viewing its code at the same time. Lastly, you can run the app on a machine connected over a network. This is especially useful if that machine support touch events, geolocation, or physical orientation sensors. To change the app's run mode, on the Visual Studio Standard toolbar, tap the down arrow next to either Local Machine, Simulator, or Remote Machine, and select a different mode. To run the app in that mode, either tap the start arrow next to the mode you selected; or tap the Debug menu, and then tap Start Debugging or Start Without Debugging. In the previous section, you worked with only three controls. Of course, there are many more controls that are available to you. Here are some common ones. The Android controls are listed in alphabetical order, next to their equivalent Windows Store app controls. For even more controls, see Controls list. Android provides three primary ways to manage navigation: temporal navigation through previously visited screens, ancestral and descendent navigation through Intent objects and the startActivity method, and lateral navigation through tabs. Temporal navigation is implemented using an operating system back stack that is managed as the user moves from one activity to another or from one fragment to another. For ancestral and descendent navigation, an activity creates an Intent object and starts a child activity using the startActivity method or through fragments. Lateral navigation takes place using tabs or swipe views. In Windows 8.1 and Windows Phone 8.1, navigation should blend into your app's content. This follows from one of the principles of Windows Store app design, "content before chrome". For more info, see Navigation design for Windows Store apps. With Windows Store apps, one of the ways to manage navigation is with the Frame class. The following walkthrough shows you how to try this out. Continuing with the MyApp solution, open the MainPage.xaml file if it isn't already visible. Select either the MainPage under MyApp.Windows or MyApp.WindowsPhone — your choice. Add a button to the MainPage.xaml file in Design view. Change the button's Content property from "Button" to "Go To Page". Then create a handler for the button's Click event, as shown in the following figure. If you don't remember how to do this, review the walkthrough in the preceding section Getting Started: Getting around in Visual Studio (Hint: double-click the button in the Design view). Let's add a new page: tap the Project menu, and then tap Add New Item. Tap Blank Page as shown in the following figure, and then tap Add. The Page class in Windows Store apps, which represents a page, in similar to the Activity class in Android app development. Next, add a button to the BlankPage.xaml file. Let's use the AppBarButton control, and let's give it a back arrow image: in the XAML view, add <AppBarButton Icon="Back"/> between the <Grid> </Grid> elements. Unlike Android, there are no system-level "back" or application-level "up" buttons in Windows Store apps. However, developers can implement navigation within their Windows Store apps through similar "back" or "up" functionality. "Back" is represented in this example. Now let's add an event handler to the button: double-click the control in the Design view and Visual Studio adds the text "AppBarButton_Click" to the Click box, as shown in the following figure, and then adds and displays the corresponding event handler in the BlankPage.xaml.cs file. Return to the BlankPage.xaml.cs file, and add this code to go to the previous page after the user taps the button. // Add the following line of code. Finally, open the MainPage.xaml.cs file and add this code. It opens BlankPage after the user taps the button. Now run the program. Tap the "Go To Page" button to go to the other page, and then tap the back-arrow button to return to the previous page. Forward navigation in Windows is similar to Android navigation. In Android, in MainActivity.java, we send an intent to invoke the second page, like this. And in MessageActivity.java, we receive the intent and the data passed with the intent to show the greeting, like this. // Show the Up button in the action bar. However, unlike Windows, Android back stack navigation is provided by ActionBar, and the user doesn't have to do anything. This walkthrough creates a new instance of BlankPage each time you navigate to it. (The previous instance will be freed, or released, automatically by the garbage collector). If you don't want a new instance to be created each time, add the following code to the BlankPage class's constructor in the BlankPage.xaml.cs file. This will enable the NavigationCacheMode behavior. You can also get or set the Frame class's CacheSize property to manage how many pages in the navigation history can be cached. For more info about navigation, see Quickstart: Navigating between pages and XAML personality animations sample. In a generic Android app, you set the default activity for the app in AndroidManifest.xml. Typically the code looks something like this. If you open the App.xaml.cs file in our Visual Studio project and browse toward the end of the OnLaunched method, you'll see code like this. This code displays MainPage.xaml after the app starts. In Android, you do animations programmatically or with view XML. A view animation allows a view to be transformed (by position, size, rotation, or transparency) to create animations. A property animation allows you to animate property values of view and non-view objects. A drawable animation loads a series of drawable objects, such as bitmaps, one after another to create an animation. Both view animations and drawable animations can be specified using either XML or code. Transition animations allow you to attract user attention by animating when a control enters or leaves or changes one of its properties. Theme animations allow you additional control over timing and order of the animations. For custom animations, you can use storyboard animations by animating a property value of a control. Animations in Windows Store apps can also be created programmatically, and they can also be created declaratively with XAML. You can use Visual Studio to edit XAML code directly. Also, Microsoft Visual Studio 2013 comes with a tool called Blend for Microsoft Visual Studio 2013, which edits XAML code for you in the background as you work with animations in a designer. In fact, Blend even allows you to open, design, build, and run complete Visual Studio projects. The following walkthrough lets you try this out. Create a new project (for either platform, or universal) and name it something like "SimpleAnimation". In this project, we're going to move a rectangle, fade it away, and then bring it back into view. Animations in XAML are based on the concept of storyboards. Storyboards use keyframes to animate property changes. There are no implicit animations in Windows Store apps but, as you'll see, animating properties is straightforward. With your project open, in Solution Explorer, press and hold the project's name. Then tap Open in Blend, as shown in the following figure. Visual Studio continues to run in the background. After Blend starts, you should see something similar to the following figure. Next, tap the Rectangle in the Tools window to select it, and then draw a rectangle in Design View, as shown in the following figure. To make the rectangle green, in the Properties window, in the Brush area, tap the Solid color brush button, tap the Color eyedropper icon, and then tap somewhere in the green band of hues. 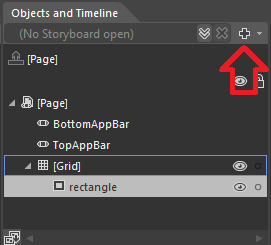 To begin animating the rectangle, in the Objects and Timeline window, tap the plus symbol (New) button as shown in the following figure, and then tap OK.
A storyboard appears in the Objects and Timeline window. 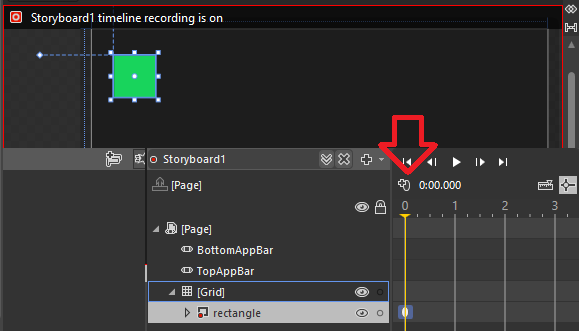 The Design View display changes to show that Storyboard1 timeline recording is on. To capture the current state of the rectangle, in the Objects and Timeline window, tap the Record Keyframe button just above the yellow arrow, as shown in the following figure. Now let's move the rectangle and fade it away. To do this, drag the yellow arrow to the 2-second position, and then drag the rectangle slightly to the right. Then, in the Properties window, in the Appearance area, change the Opacity property to 0, as shown in the following figure. To preview the animation, tap the Play button, which is circled in the following figure. Next, let's bring the rectangle back into view. In the Objects and Timeline window, tap Storyboard1. Then, in the Properties window, in the Common area, tap AutoReverse, as shown in the following figure. Finally, tap the Play button to see what happens. You can run the project by tapping the Project menu and then tapping Run Project (or just press F5). If you do this, you'll see your green rectangle, but the rectangle won't animate. To start the animation, you'll need to add a line of code to the project. Here's how. In Blend, tap the File menu, tap Save, and then return to Visual Studio. If Visual Studio displays a dialog box asking whether you want to reload the modified file, tap Yes. Open the MainPage.xaml.cs file, and add the following code. Run the project again, and watch the rectangle animate. Compare this to a similar Android animation that animates the location of a square and its opacity. The animation defined in XML has many similarities, as shown in the following code. The animation is started programmatically with the following code. In Eclipse, the animation must be designed by hand. In Windows, Blend makes it much easier to design the animation interactively and test it. For more info about animations, see Animating your UI. Windows 8 Product Guide for Developers: An overview of Windows Store app development principles like live tiles, features like app contracts, frameworks like the Windows Runtime, tools like the Windows Driver Kit (WDK), and more. Designing UX for apps: How to plan the user experience, get design guidance for Windows Store categories like games and productivity apps, and download design assets like PSDs. App contracts and extensions: How to declare agreements between your apps and other apps and Windows, for example the Play To contract and the Game Explorer extension. Working with tiles, badges, and toast notifications: How to create tiles, update tiles and their badges, send toast notifications, and show and update tile and badge updates on the lock screen. Launching, resuming, and multitasking: How to auto-launch, activate, suspend, and resume apps, and how to work with background tasks. Guidelines for roaming application data: How to provide a great end-user experience for apps where the user utilizes more than one device, such as a PC at work and a tablet at home. Windows Store app samples gallery: Hundreds of samples for you to browse, download, and experiment with. Also, be sure to visit our Community resources to learn how to get help and get connected through developer forums, blogs, developer camps and workshops, and local Microsoft events and contacts. We think that Windows 8.1 and Windows Phone 8.1 will open up new app-building opportunities for you. We look forward to seeing all of the great apps that you're going to build!